Three members of the Salem Red Sox have been named to the Carolina League squad for the California League/Carolina League All-Star Game. 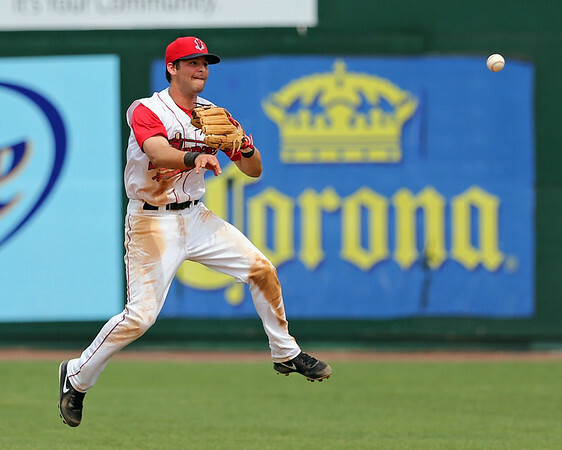 Salem announcer Evan Lepler reports that pitcher Justin Haley, second baseman Reed Gragnani (pictured), and utility man Jonathan Roof will represent the Carolina League in the June 17 contest at Frawley Stadium in Wilmington, Delaware. Haley has been a constant force on the Salem pitching staff despite going back and forth between a starting and piggyback role. In 49 innings across 11 appearances, Haley has a 2.20 ERA with 39 strikeouts against only 15 walks. Cutting down on walks has been a big part of his success so far in 2014. After walking 5.3 batters per nine last season, Haley has slashed that number to 2.8. The 6-foot-5 right-hander was a sixth-round pick in the 2012 draft out of Cal State-Fresno. Gragnani has taken the Carolina League by storm in his first full professional season. The 23-year-old out of the University of Virginia leads the circuit with a .337 batting average and ranks in the top five in several other categories including hits, runs scored, and on-base percentage. Roof's versatility made him a key contributor for Salem in the first half, as he saw playing time at second base, shortstop, third base, and left field. Selected in the Triple-A phase of the Rule 5 draft in December out of the Philadelphia organization, Roof has also contributed with his bat, hitting .301/.384/.461 in 50 games. However, Roof may be unavailable to participate in the All-Star festivities - he was moved up to Double-A Portland on June 1.